Here is an excellent and memorable article about practicing by Peggy Swingle, a Suzuki piano teacher and teacher trainer, from the American Suzuki Journal, Summer 2004. People practice all the time without understanding why. If you ask students or parents why they practice, these are the typical answers: “to learn a new piece,” “to make it better,” “to be able to play it,” “to learn the notes,” “to not forget,” “because I have to.” (!). While these may be part of the answer, there is a much simpler answer which takes in all these and much more: the reason to practice is to make something easier. It seems so simple, yet this reason has in it the potential to make practice interesting and productive. If everyone in the Suzuki triangle really understands this definition, the battle of practice can turn into an interesting team effort. 1. Probably the greatest area of misunderstanding, and the cause of themost conflict between parents and students is the confusion between practicing and playing. These are not the same thing and the difference between the two needs to be very clear to everyone in the triangle. Many years ago when I was teaching at many summer institutes each year, I had several opportunities to discuss practicing with large groups of children while their parents were attending another class. To my great surprise, no matter where I was or what country I was in, if I asked the question, “What is the thing about practicing that you don’t like?” I got the same answer—”My mom (or dad) interrupts me in the middle of a piece.” I thought a lot about that and realized that if the student was in the flow of a piece and focusing all his/her concentration on playing and suddenly a voice said, “That was supposed to be a fourth finger on G,” or “Remember that , crescendo coming up,” the interruption would be very jarring. Not only does it teach students to play with part of themselves always waiting for the ax to fall (actually teaching them not to concentrate fully on their playing), it also instills fear of making mistakes, taking away the joy of playing. Children are very smart. Theirs was the perfect answer to my question, because what the students had been doing was playing the piece, and that’s the time for mom and dad to button their lips! 2. Practicing in small sections or bits means identifying the elements in a particular measure or passage and deciding on what I call the student’s “‘jobs.” There may be a listening/sound job: are all the notes even? did you like your tone? was the articulation correct? Then there may be a physical job needed to achieve the listening/sound goals: did you pick up your finger? is your bow straight? is your arm behind your hand? did you play in the appropriate part of the bow? Students need exact information on what they are trying to accomplish. Mind and body should be busy and intrigued to produce the sounds they want. Each repetition is a chance to get that spot closer to the goal and easier and easier to reproduce more and more times in a row. If each repetition has a goal and can be evaluated for specific goals, repetition is not boring! It is fascinating and challenging. This kind of practice is hard work, which is what makes it so satisfying. I tell my students that they should be tired after a practice! It means they worked hard. It also means that practicing needs to be interspersed with playing or other activities. Effective practice is directed repetition of short segments with clear goals. -finding the small sections which are causing the stumbles, memory problems or technical difficulties. The goal of practicing is to make playing and performing easy and enjoyable. Good practicing allows the playing to happen with flow and expression. In order to play well, the details have to be at least on the way to being automatic and the player cannot be worried about that tricky section coming up! That’s why effective practice is vital to success. Playing the piece over and over, especially before it is really solid, actually makes the piece worse because the wrong notes, the hesitations and the uncertainty just get reinforced. 4. Slow practice is the bug-a-boo of most children. They don’t like it because it’s hard! Even older students resist it mightily. (I do not recommend it for very young children four and under: they need enough speed to avoid losing the sequence of the piece.) But for the students five and beyond slow practice creates a solid and confident performance. If the teacher and parent can make slow practice interesting, eventually the student realizes that it really does make playing and performing easier and more enjoyable. But just telling a child to slow down rarely works. Children need some images and fun ways to do slow work. “Put that spot under a microscope and be sure you can hear and see every detail;” or “It’s like weeding a garden. If you run through the garden you can’t see the weeds and you might pull up the wrong sprouts!” “Practice fast slowly: can you put your ‘slow-mo’ switch on and do everything you would do fast only very slowly? It’s fun to demonstrate this one: the student presses my slow-mo button and I start talking and gesturing very slowly; the I press the student’s slow-mo button and it’s their turn, first with speaking and moving, then with playing. Five slow repetitions are worth their weight in gold! Especially with my pianists, we have a little saying : HS=HS. This means Hands Separately equals Half Speed. Dr. Suzuki said, “Smart people have a big problem! They learn quick and they forget just as quick!” Teaching bright children is difficult because if you show them something, they can copy it quickly so it appears that they can do it. But if you ask them to do it again a few minutes later, they often have no idea what you are talking about! A slower child, on the other hand, may have to do ten repetitions just to get it right, but will probably remember it afterwards. So I tell m students Dr. Suzuki’s comment and I say, ” Be a smart person who remembers! Can you do it five times in a row?” Remembering to do the task correctly becomes a game, and both student and parent are more likely to remember what to practice and how to do it correctly. A fun game we often play is “Can I make you forget?” We work on a skill until the child can do it reliably. Then I ask, “Can I make you forget?” Then I ask what they had for lunch or what their favorite color is today or one thing they did at school. After they tell me I say, “I bet you forgot!” And, of course, they rarely do. Mrs. Kataoka was fond of saying, “Your brain is very smart but your muscles are dumb! Your brain understands right away but your muscles have to do it lots of times to remember.” You can use examples appropriate to age and interest. For example, I tell them that when I went to the circus, I saw the acrobats walking on the tightrope hundreds of feet in the air. My brain understands what they were doing: they put one foot carefully in front of the other and use a pole to keep balance. But, I’m not going to get up there and do it My body has no idea of how, and I would have to practice six inches off the ground for quite a while before I could go on the high wire. So often our brain understands what we want to do, but our muscles need to be trained and given many chances to perfect a skill. 1. I believe the all people, but especially children, are very intuitive. We read subtle body language, facial changes , and tone and inflection of voice. The better we know someone, the more attuned we are to these subtle signs. For example, your spouse may say something at a party which everyone takes at face value but you know she or he is angry or upset. A slightly lifted eyebrow or a smile which becomes a smirk, a slight lean toward or away from someone—we are all adept at reading these signals. Children are aware of their parent’s body/voice language to the nth degree. They respond to our physical signals and to the tone of our voices (rather than the content) almost automatically. (In fact, listening to what someone says—content—rather than responding to tone is something which has to be learned because, unfortunately, in our society the two often don’t match! It is a subtle kind of dishonesty which is very confusing to children) . Parents and children often get into a vicious cycle of practicing. The parent knows it’s time to practice and, remembering previous difficult practices, gets tense. Her voice and face reflect negative thoughts and worries which the child picks up and mirrors right back. How to break the cycle? Affirmations are very powerful and can have amazing results. 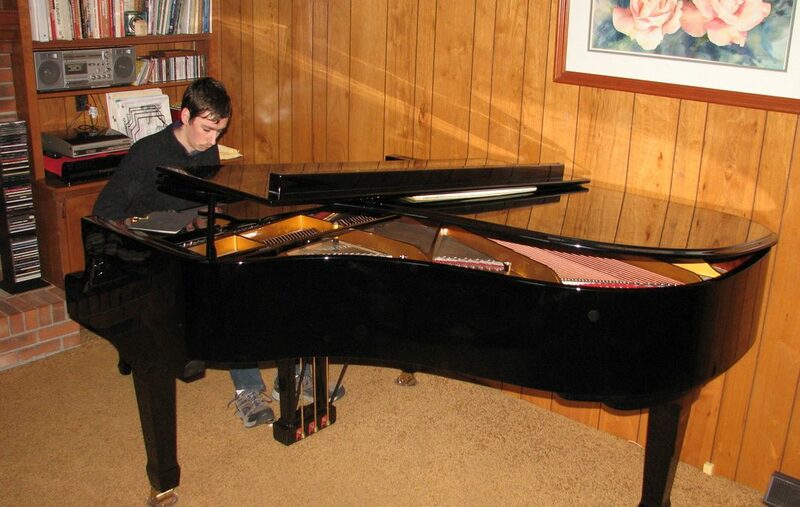 Before initiating a practice, start saying positive things to yourself: “I enjoy practicing with Susie,” “I’m so glad to have this time with Joey,” “Learning to play the piano is very exciting,” “We have fun when we practice together,” etc. Choose one or two which are the most appropriate to your situation and quietly say them to yourself ten times each. This will change your face, body language and tone. It takes less than two minutes and yet it is probably the most important thing you can do to turn practicing around. The affirmation strategy will not work instantly–your child will not trust it at first—but if you do it faithfully every day for two weeks, you will notice a change in your child. Change yourself and your child will mirror your change. · Shall we start with the new piece or review? – -How many times do you think it will take to make “X” easier? · Is it easier now? · Is it so easy you could do it in your sleep? If not, how many more times would that take? – Do you like your sounds? · Do you think the people in the back row could hear that phrasing? · Let’s look at tomorrow’s schedule and decide when to practice. This is a very simple and effective remedial game if the parent and student are really having trouble working together at home. It is meant for students ages four to eight. Parent, teacher and student have a conference at the lesson. The teacher, explains the game. First, this is the definition of cooperation: “When someone asks you to do something, you say OK and do it with a smile.” We practice on silly things like: “Could you please stand up?” “Could you put your right hand on your head?” “Could you jump up and down three times?.” In each case the student says “OK” and does it with a smile. So the game is that for every day that mom says (in a happy voice) “It’s piano time,” and the student says OK with a smile, the student gets one point. I usually suggest that this goes on the calendar. We decide at the lesson conference what three points are worth. This might be a lollipop or a special cookie or some tiny toy. It’s important that this reward is decided on before the game starts so that the student knows what s/he is aiming for. The first goal is to get three points. This is only for coming to the practice cooperatively. Then parent and student can try for four points (days), again with a small reward decided oncbeforehand. It’s very important at this stage that the practice itself is kept very short. This is behavior modification and the only goal at this point is to change the attitude toward starting to practice. The first step is to get three or four consecutive days of cooperative practice. The next step is to increase the number of days of consecutive, cooperative practice up to seven days and then ten days and then 14 days with the reward (always decided on beforehand) getting a little bigger each time. After parent and student have gotten to 10 or 14 days, usually the game fades away by itself, but the behavior has been changed. (3) play a review piece. The Cooperation Game can be a very successful way to change practice behavior patterns, but in order for it to work, the child must really understand the meaning of cooperation and the parent must understand that this is to change behavior, not learn lots of new pieces. Practices will be quite short. There may be little actual progress in instrument skills or repertoire for the few weeks while you are doing this game, but if you get a real change in behavior, progress after that will be rapid and everyone will be happier!